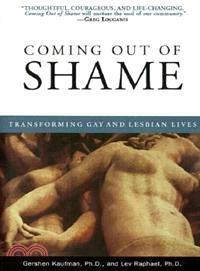 In Coming Out of Shame, Gershen Kaufman and Lev Raphael expose the role shame has come to play in gay and lesbian lives. Rarely discussed but vastly important, shame powerfully shapes each individual's development of self-esteem, identity, and intimacy - three areas where gay men and lesbians have been extremely vulnerable to the crippling effects of shame. Tracing the historical and cultural sources of gay shame, Kaufman and Raphael reveal how gay men and lesbians have internalized shame, resulting in self-loathing and self-destructive behaviors. The hallmark of shame is silence, and by breaking the silence around the dynamics of gay shame, Kaufman and Raphael offer a way to "come out" of shame and begin the journey toward wholeness and self-acceptance. Filled with the experiences of those struggling to overcome shame, Coming Out of Shame includes strategies for storing self-esteem, creating a positive gay identity, healing scenes of shame, and developing partnerships in intimacy. Self-affirming and inspirational, Coming Out of Shame guides the transformation of gay shame into gay pride and empowers gay men and lesbians as no other book has done. Gershon Kaufman, PhD,?is the author of several works on the subject of shame including, Coming Out of Shame: Transforming Gay and Lesbian Lives. He is a professor at Michigan State University and lectures on shame and self-esteem. Lev Raphael, PhD,?is the author of several works including a collection of short stories, Dancing on Tisha B’Av. He teaches creative writing, popular literature, and Jewish American literature at Michigan State University.